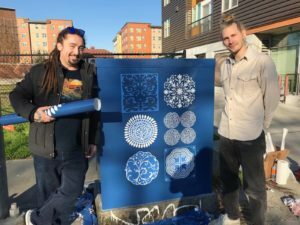 In November, 2018, we installed five brightly-colored signal box wraps at Beacon Hill intersections that incorporate the Common Threads: Community Patterns motifs of the Carl Smool art installation at Beacon Hill’s Link light rail station. This project is one of multiple efforts to unify and beautify the north Beacon walking district—helping people enjoy all the neighborhood has to offer, making the area more walkable and easier to navigate. The signal box wraps come in on the heels of the wayfinding signs (red poles with blue signage, see below!) we installed in 2017 and precede the “Welcome to Beacon Hill” signs we are working on for 2019. 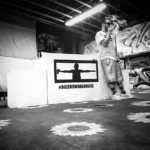 Dozer Art — Crick Lont, creator of Dozer Art, has been pushing the envelope of creativity and bringing the world his expressions and thoughts, in a stylistic manner, that has awed audiences across the country. With collaborations including local and global artists, he has created a platform for his art and has used this as a means to help other artists get recognition for their talent. Dozer Art has made it a mission to bring art to the world and help artists alike have a chance to be seen. 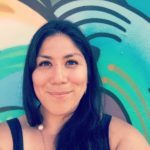 Angelina Villalobos — The mental inspiration for my body of work is Folklore; stories humans have created and collected to explain the unknown. Tales about animals and their wit especially pique my interest. Religion is also another way humans have used to explain what they don’t understand. The visual inspiration my work pulls from include Mexican Folk, Mesoamerican, Pacific Northwest Native American, and Japanese art. These are then filtered through the eyes of an anime and comic book lover. WAYFINDING: Does street pole signage improve walkability? With funding from the Office of Economic Development in 2016 we were able to work with SDOT to have nine poles installed along Beacon Ave. S. from S. Spokane up to the corner of Beacon Ave. S. and S. 14th. The signs point to public destinations like Jefferson Park and the Library, but also mark lesser known places like 12th Ave. View Point. Folks in the neighborhood already know which direction to turn when they’re headed off to the park, but we hope they’ll encourage visitors to explore a bit when they step off the Light Rail for lunch. After months of vigilance the warehouse door at S. 15th and Beacon Ave. S stayed free of tagging (thanks to our service contract with Graffiti Busters) and we embarked on a mural project that would change the vibe of the neighborhood. The fact that this wall site happens to be in the smack center of our north commercial district gave us inspiration to put the project together. We called on local urban artists Charms Won and Crick from Dozer Art. Both were game—and while Beacon Hill Merchants managed the project, provided for supplies and other project costs—we take our hats off to these two artists for pulling it off in just three days! Take note: the building will eventually be demolished, but we hired Crick to put his signature sunflowers on Beacon Hill bus shelters (see this page, above) and are working to preserve the whale. Many saw the wall up close while visiting the space, now known as “Dozer’s Warehouse,” and the adjacent Beacon Arts TBD Gallery and Community Art Space (between May 2017 and August 2018). Crick is working on a new venture in the space: “Dozer’s Warehouse and Gallery.” Stay tuned for more! And make sure to check out the mural as you pass by Beacon Ave. S. and 15th Ave S. and take it in while it’s there.